In the grand scheme of things (Intelligentsia was founded in 1995), the Logan Square branch is relatively new, only opening in 2014. It’s on Milwaukee Avenue, just down from Buzz Coffee Roaster & Baker and across Logan Square from Passion House Coffee Roasters. Located on the southwestern side of the street, it has a broad, glass front and a neat outdoor seating area. This is on the opposite side of the pavement from Intelligentsia, on a wooden deck that extends into the street, screened from the traffic by low concrete walls and multiple planters. Running the full width of Intelligentsia, it’s long enough to hold three round, red tables with matching folding chairs. The door is inset on the left, while to the right there are six, tall, thin, metal-framed windows which run from almost floor-to-ceiling, stretching the full width of Intelligentsia and making the front almost entirely glass. Inside, it is rectangular, roughly twice as deep as it is wide, with the space defined by a long, central island counter set back from the windows. This leaves space for four round tables in the window with a long, wooden bench/windowsill which doubles as both table and seating. You’ll find 16 fixed stools down the sides of the counter, with eight on either side. At the back, there’s a pair of high cocktail tables on the right with another on the left, while three tables project from the left-hand wall, each with a single, low stool and a long, low wooden bench. You’ll also find the retail shelves (beans) on the left by the door, while the right-hand wall has retail shelves for coffee kit. The till is at the front (short side) of the island counter, slightly offset to right, with the cakes beyond that. The main espresso machine, a three-group La Marzocco Strada, is on the left with a second, two-group Strada at the back. The batch-brewers, pour-over (V60, with the options of Kalita Wave and Chemex reserved for specific beans) and tea are on a narrow workspace down the centre of the counter. In a nice touch I’ve not seen at the other Intelligentsia branches (each is very much its own location), if you sit at the counter, one of the baristas will take your order and bring your coffee to you when it’s ready, which is a very civilised way of doing things. Otherwise, it’s the usual order and collect at the till. Intelligentsia rotates the various single-origin offers on a daily basis, drawing from its large stock. At the end of a mini-coffee crawl, I’d already had an espresso and cortado (Buzz), a pour-over (Passion House) and another espresso (Gaslight Coffee Roasters) so decided to get the set with a batch-brew, a Honey Bourbon from El Salvador. This was served correctly, in a carafe with large-handled mug on the side, all presented on a wooden tray. There was also a glass of sparkling water, constantly refilled through my stay. My batch-brew was excellent and smooth, developing a little more sweetness and fruitiness as it cooled. Talking of sweetness, I’d been trying to get a doughnut all day, but everywhere I’d gone, they’d sold out. 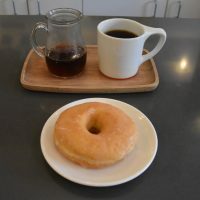 However, Intelligentsia came to the rescue and I had a lovely honey-glazed doughnut which was light and fluffy, with a sweet glaze, but without being sickly. This entry was posted in Cafe/Roaster, Cake, Chicago, Coffee Shops, Evening Opening, Island Counters, Laptop Friendly, Retailers and tagged Chicago2018, include, Intelligentsia by Brian Williams. Bookmark the permalink.